This cloudy morning, fans of catching tuna , set sail from the city's port at about fifteen as large as small boats in traditional september's hunt of bluefin tuna which will last three days from 04 to 06.09.2014. year . 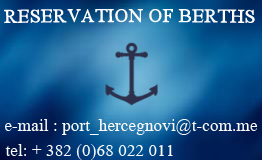 The organizers of the hunt called "Big game Bluefin" are the coffee bar Citadel , the fashion house Konstantin - tex , the Agency for the management of the city port Herceg-Novi, a company Nautilus and sports - fishing club Jugole Grakalić . Weighing the catch is provided every night in the restaurant " Blufin " on the Square .